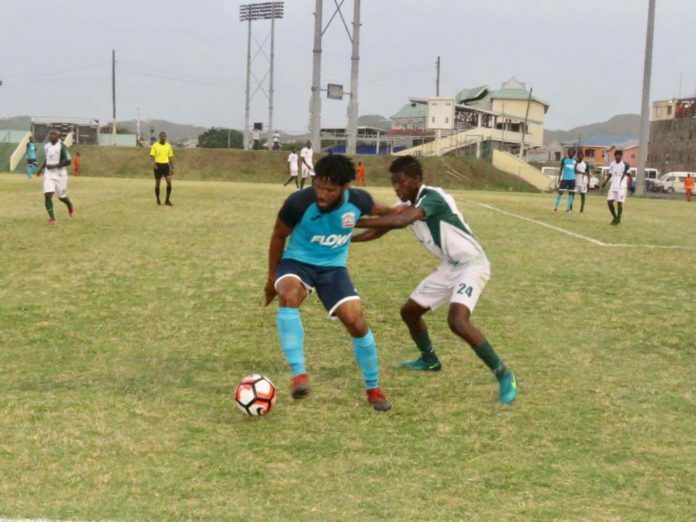 Basseterre, St. Kitts – The defending champions, the Flow 4G Cayon Rockets, will face off with the Hobson Enterprises Garden Hotspurs in the finals of the St. Kitts Nevis Football Association (SKNFA) Premier Division following a dramatic Final Four campaign played at Warner Park. The Cayon team will play its second straight final after its 2016 triumph, while the Spurs team will make its first finals appearance in 17 years. Both teams enter the Final Four after a regular season behind former champions, the SL Horsford St. Pauls, and ahead of the Rams Village Superstars. It took six games for the two teams to separate themselves. In the first game of the competition played last week, the Cayon team came out trumpiant with a slender 1-0 victory over the Spurs team. The winning goal came from Vince Nelson midway through the second half. Later that evening, an early goal after just two minutes came from Joash Leader for St. Pauls, giving them a 1-0 victory over the Village Superstars team in a close encounter. Victories on Match day one gave the Cayon and the St. Pauls teams an advantage in the competition. Match day two was scheduled for Saturday, May 27, but after 60 minutes of the first game between Cayon and Village, a shooting incident inside the park delayed the match until the following day. At the time of the delay, the Cayon team was ahead 2-0 following goals by Javeim Blanchette and Carlos Bertie. However, in the game restart, the defending champions added a further two goals to complete a commanding 4-0 victory, all but securing their place in the finals. Their final spot was confirmed when St. Pauls and the Garden Hotspurs played to a 0-0 draw, meaning both teams had to wait until the final day to learn their fates. Heading Tuesday into match day three, St. Pauls only needed a draw versus Cayon to secure its spot in the finals, while the Spurs team needed a win versus Village and a St. Pauls defeat in order to make the finals. In the first game Tuesday, the Spurs team thrashed the Village team 5-1 after a very frustrating first half in a game that saw them receiving two penalties and the Village team being reduced to nine men, with two players being sent off for red cards. With a Spurs victory, St. Pauls just needed a draw versus Cayon, a team they beat all season in all three rounds. However, the Cayon side came out looking the better of the two and took the lead after 26 minutes when Javeim Blanchette capped off a beautiful team goal, to the delight of both Cayon and Garden Hotspurs fans, who celebrated as if their team had scored. Shaquille Pringle then doubled the Cayon lead and again sent the Spurs fans into rapture in the stands. However, three minutes into the second half, St. Pauls got one goal back to set up a dramatic finish, especially for Spurs fans. The game then had a twist when shortly after slimming the lead, the St. Pauls team was awarded a penalty that was saved by Adolphus Jones in the Cayon goal that turned out to the be the first of five match winning saves he pulled off, denying St. Pauls the eqaulising goal and handing Cayon a dramatic win. The defeat for St. Pauls meant that the Spurs will play the best of three final versus Cayon, starting June 11.